It’s interesting how these things happen sometimes. I’m always amazed how in the face of tragedy, God has prompted me to look through my home and out of nowhere I suddenly “discover” all these things that could help someone else. I immediately thought of the bathroom set sitting on the top of my closet shelf: shower curtain, shower hooks, trash can, fish decorations, a new shower sponge with two unopened bottles of bath wash. I kept meaning to list it on Craigslist, but… well… God had other plans! Then I opened my linen closet. I immediately spotted the flowered twin sheets from when my daughter used to have a twin sized bed. Oh! Her comforter! That could be given away, too! With each blink of an eye it seemed my closet had become a donation warehouse of sorts. Towels. Washcloths. Curtains. I barely had all the items stuffed into a bag when it occurred to me that all those little girls would need toys. And books. And crayons. Markers. Activity books. Coloring books. Right now, those sweet little girls needed a distraction for the loss of all their possessions. I found a stuffed animal for each of the children so they would have something to snuggle with when they went to sleep, wherever that may now be. I even found a purse of my daughter’s filled with play jewelry. (Every little girl needs play jewelry!) 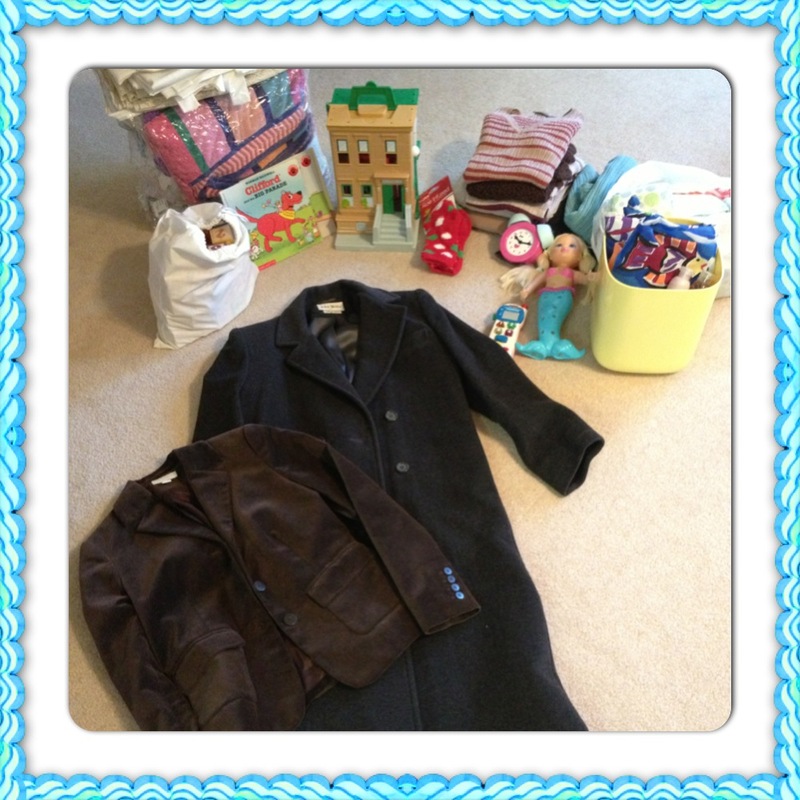 With each item I gathered, I prayed for this family, that through a simple Facebook plea all their needs would be met. I checked back on Facebook to find more details posted about needs: Mom wore a size 3-5 pants, small tops, size 8 shoes. Right there I got chill bumps. I wear a size 4! Perfect! I went into my closet and made two outfits of sweaters and pants, then threw in another sweater and a few shirts. (As many of you know, I keep a pretty “bare bones” closet – if I haven’t worn something in the past year, it doesn’t stay in my closet! Unfortunately, I had already cleaned out my closet about a month before, but I was willing to part with a few favorite outfits. :-)) I also found a long wool coat and another shorter coat for Mom. Unfortunately, I wear a size 6 shoes, so I wasn’t able to donate any footwear. 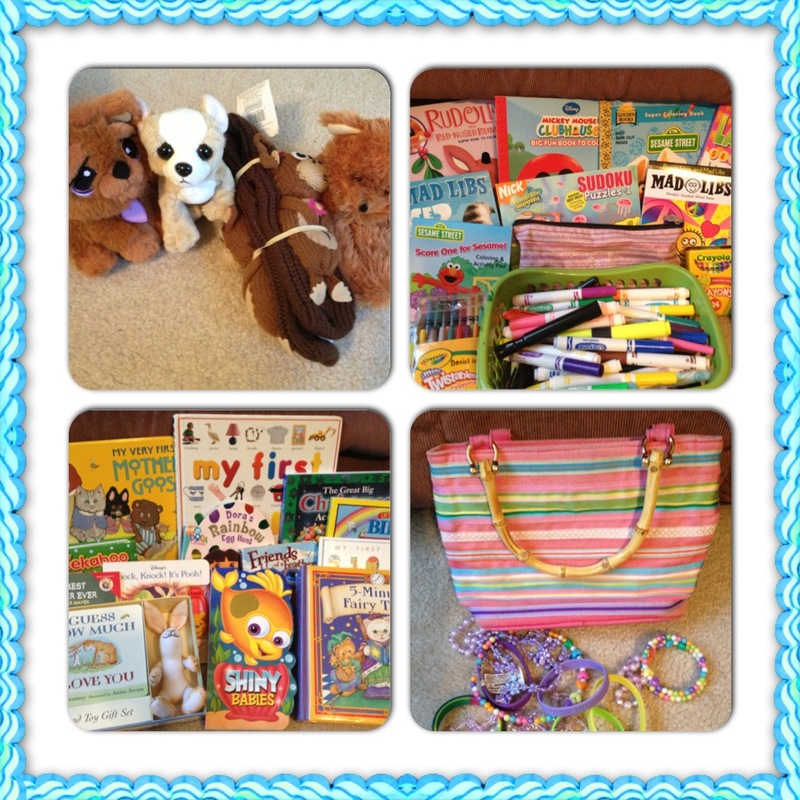 I remembered several friends who had donated items to my 40th Birthday Project: books and “Blessing Bags” (bags filled with essentials such as toothbrushes, toothpaste, shampoo, etc.) I gathered those items as well. As I was laying everything on the floor to take a photo for this blog, a small oak box caught my eye. My jewelry box. That’s when the impact of this devastation hit me. This mom had lost all her jewelry, too. I literally stopped everything as my thoughts raced ahead of my actions. No jewelry. No family heirlooms to pass down to her daughters. Gone. Everything. It was almost too much to bear, and made me think of the recent events of Hurricane Sandy and all those that had lost similar treasures. As I made one final sweep of my closet and bedroom, my gaze landed on one final item. 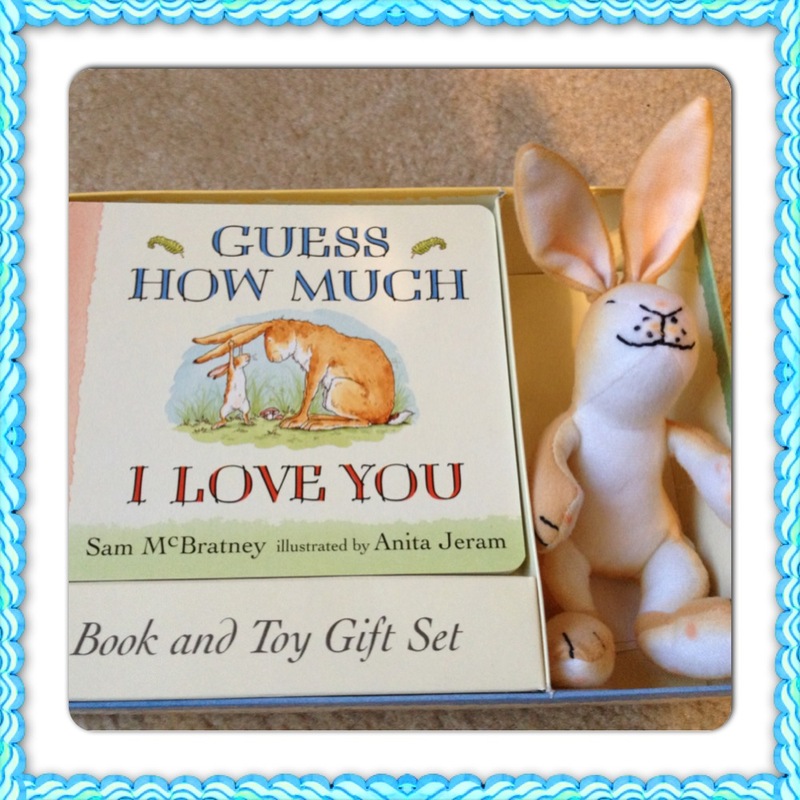 My absolute favorite children’s book of all time: Guess How Much I Love You. All three of my babies were rocked to sleep as infants with me reading this book to them, snuggled safely in my arms. Each time I see the book at a yard sale or consignment store, I buy it and then wait for an opportunity to bless someone else with the gift. This particular version came as a gift set with the main character of the book, a sweet little bunny. If you’ve never read this book, please do, especially if you are a parent. The story ends with my favorite storyline: “I love you all the way to the moon… and back.” Without a moment’s hesitation, I grabbed the book and bunny and jotted a note for this family, including my project business card so they could know that even in the midst of tragedy, they were loved. Then I loaded everything in my car and dropped it off on the friend of a friend’s front porch. No one was home, so I simply left all the bags by the door. If you would like more information of this family’s needs, or how to donate, please send an email to celebratekindness@gmail.com or if you know me on FB send me a PM and I will get all the details to you. Even if you only have a few items to share, a little can add up to a lot! 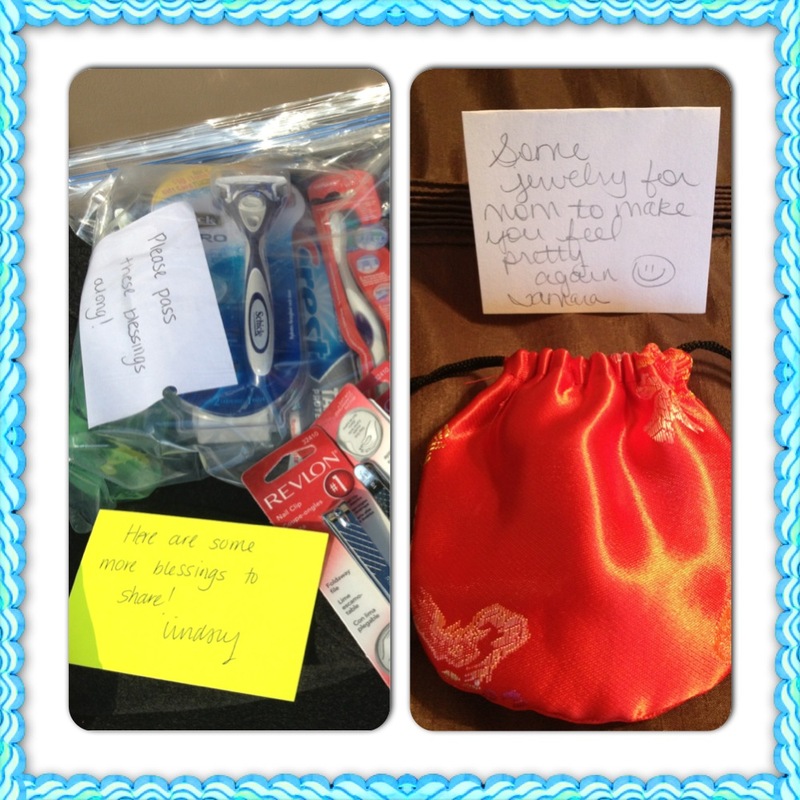 2 Responses to "Random Act of Kindness #33"
community. Your website offered us with helpful info to work on. You’ve done an impressive job and our entire neighborhood might be thankful to you.